Burgundy range stereo intergrated amplifiers from Papworth Audio Technology. Burgundy Range TVA8 Pure Class A Papworth are pleased to announce the introduction of the TVA 8. This pure class A, two channel, integrated, amplifier has been specifically designed to make superb music with higher sensitivity loudspeakers. This affordable, reliable, and superb sounding single-ended amplifier uses EL34 pentodes, to produce 15 Watts per channel into 8 or 4 Ohms. The output transformer is multisectioned for low leakage reactance and excellent long term stability. Input selection is by high quality relays, giving extremely low figures for adjacent and co channel crosstalk. The hard wired star earthing ensures low frequency noise is virtually absent from the loudspeaker. Both the power and output transformers are to Papworth designs, and made by a leading UK manufacturer. The gain control is manual, and can also be rotated by infra red remote control. 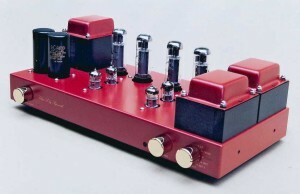 In the ten years during which Papworth has promoted its valve products on a world market, this is the first fully integrated pure valve amplifier to be released. The TVA 8 is seen as a first step to ownership within the Papworth range. All of the know how and technology of the famous Papworth monoblocks, are carefully woven into this product. During the eighteen month development and trial period the improvement of noise levels in conjunction with the required musicality of Pure Class A, has resulted in a serious new product for Papworth. This class A amplifier is also the first to use our new house colour of Burgundy to establish a new image for valve audio products. The TVA 8 was developed in conjunction with Walrus Systems, and we are pleased to appoint them as our sole distributor for this product in the UK. Burgundy Range TVA10 Integrated Papworth Audio are pleased to announce an addition to the Burgundy range. The world famous TVA 10 is now released in a fully integrated version with five selectable inputs and infra red remote gain control. This stereo amplifier credited with starting the valve revival in the late nineteen seventies is now available for the first time as an integrated amplifier. 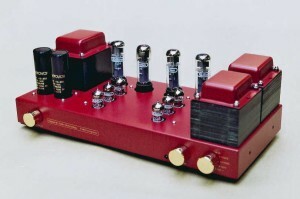 The component specifications including that of the output transformers, remain the same as when the product was originally designed by Tim de Paravicini, for Michaelson and Austin more than twenty years ago. The input selector module was developed to meet a high target specification. The incorporation of DC operated relays for input selection has achieved ultimate low levels of adjacent and co-channel crosstalk. This input selector design in conjunction with better power supply provision for the driver stages of the amplifier has produced an integrated amplifier with soundstage and dynamics better than that of the original power amplifier. The Alps Velvet motorised potentiometer was chosen for gain control. This allows both manual adjustment of gain and also the movement of the potentiometer from the listening position by use of the infra red remote controller. The circuit topology of the TVA10 is the same as that used in all of the higher power Papworth Audio monoblocks. This comprises the McIntosh derived output stage, which by use of the bootstrap driver achieves very low levels of distortion. There is no feedback taken from the loudspeaker winding of the output transformer, therefore the amplifier will drive any loudspeaker without the characteristic of the amplifier being affected by the loudspeaker impedance. This amplifier can deliver 55 watts into loudspeakers of four; eight; or sixteen ohms. The output valves are EL34 pentodes are Electroharmonix, made in Russia by Sovtek for ultimate reliability.